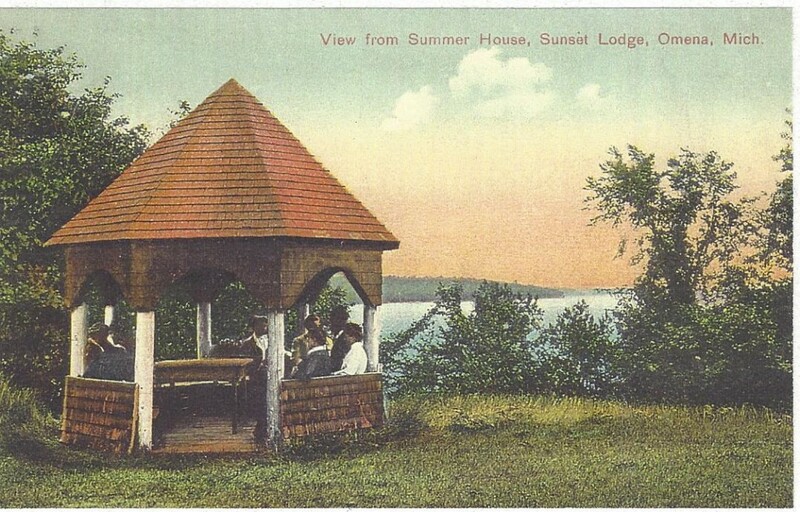 Sunset Lodge was established in 1898 by Leonard and Rhoda Wheeler. 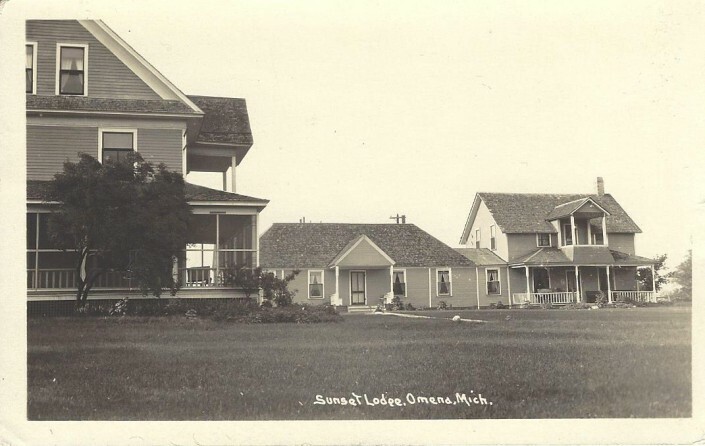 They came to Omena from Beloit, Wisconsin in 1868 and built a small house just north of the village. After some years they left Omena but eventually returned to build a home for their ‘sunset years’. 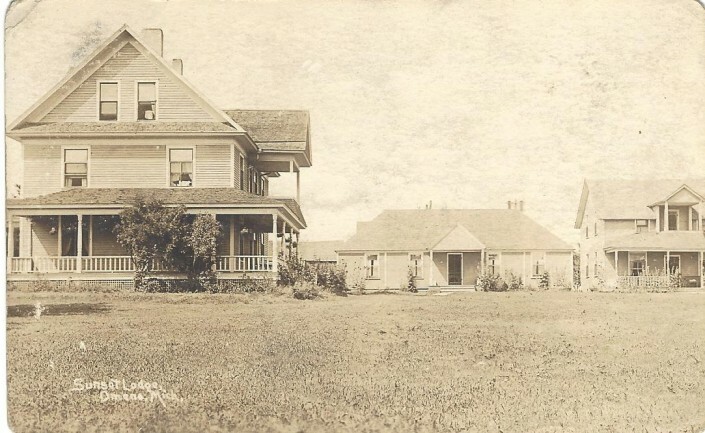 Their large three- story home on the hill overlooking Omena Bay was completed in 1891. 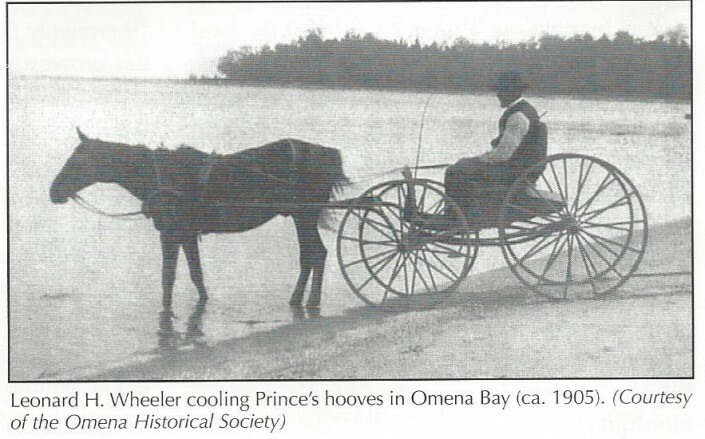 By that time Omena was becoming a popular summer retreat, and the Wheelers recognized the potential of their wonderful location as ideal for tourists. So their sunset years plan changed, and they developed Sunset Lodge into an expansive full-service resort. 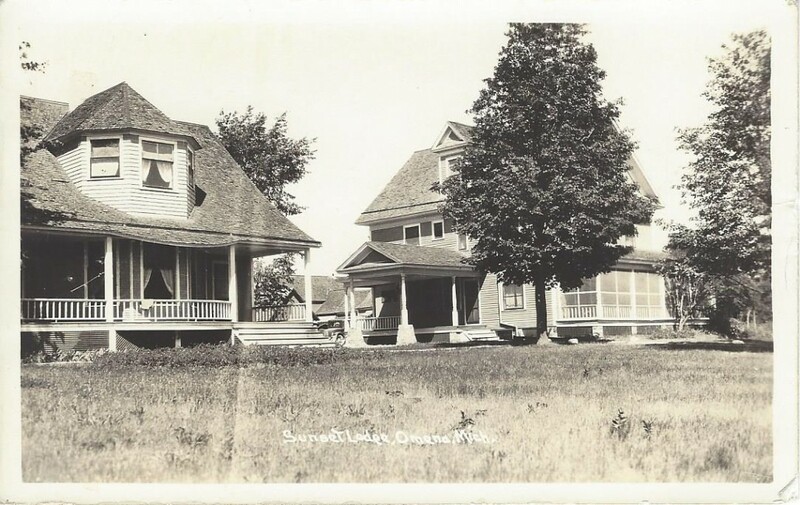 Two guest cottages were built next to their home, named for the Shedd and LeMieux families from Chicago who were frequent guests. 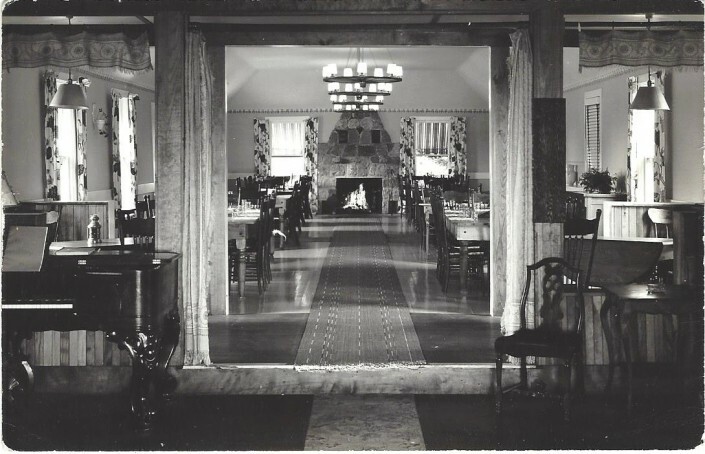 Other buildings included a dining hall with a social hall attached, staff housing and laundry building, ice house, large barn and an artist studio. These buildings were constructed between 1898 and 1907. Today five remain: the main house (Wheeler House), the two guest cottages, the barn, and the social hall. The area’s first tourists arrived via steamship, usually from the Chicago area. 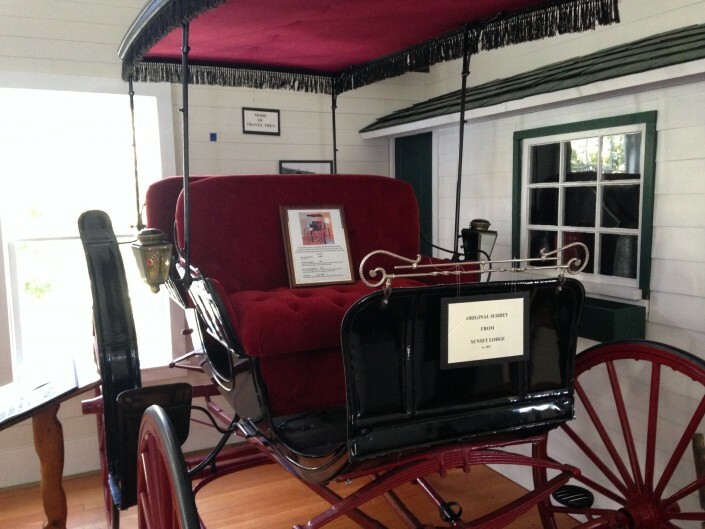 Sunset Lodge operated a horse-drawn surrey to greet guests at the dock and transport them up the hill (that surrey is now housed at the Omena Historical Society Museum). Train service began in 1903 and tourism continued to grow. 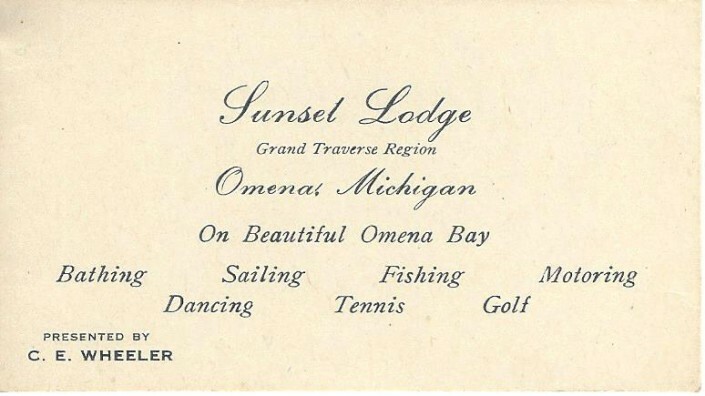 Omena became a popular destination: in its heyday there were eight major resorts, some of them quite famous. 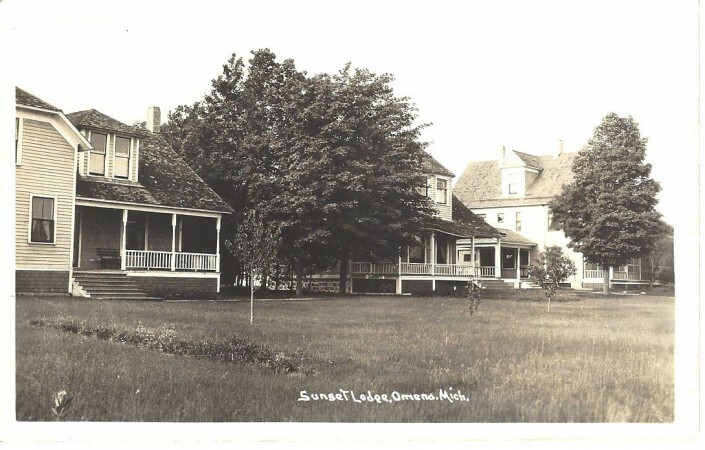 The depression, WWII, and the automobile all brought significant changes to Omena’s resort businesses. 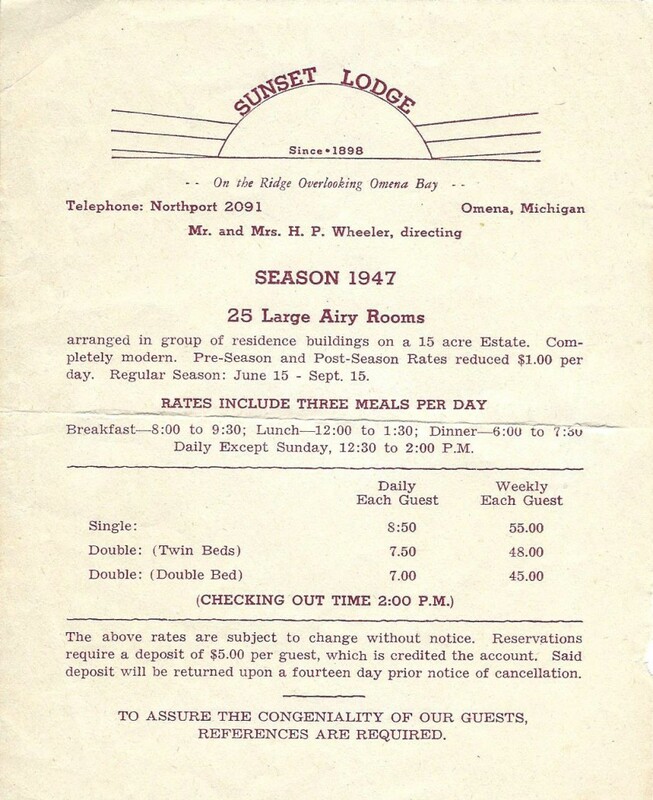 Many struggled to adapt to the modern tastes and shorter visits from more-mobile guests, and by the 1950s most had closed (of these, only Sunset Lodge remains today). By then, the Wheelers’ descendants were operating Sunset Lodge; they ceased running it as a full-service resort and instead rented out the cottages. In the 1990s, the new owners Dave and Linda Jacobs opened Sunset Lodge as a seasonal Bed & Breakfast. The Jacobses repaired and faithfully restored all of the buildings, and saved the social hall from possible demolition. Sunset Lodge became a beloved destination for a growing community of loyal guests. Dan and Mary Ziegeler purchased Sunset Lodge in 2014, and will continue its long tradition of welcoming guests to this very special area. The features that have drawn visitors to Sunset Lodge and Omena since the 1890s are eternal: the magnificent natural environment of lakes and dunes, rivers and forests, orchards and farmland. Then as now, tourists hiked and fished and sailed and swam. Today’s visitors can enjoy Leelanau’s vineyards and wineries, art fairs and cultural events, museums and galleries, golf courses, hiking and bicycle trails, state parks and lighthouses, and of course the greatest jewel: Sleeping Bear Dunes National Lakeshore.